It never fails to amaze me what's available out there for jewelry artisans. 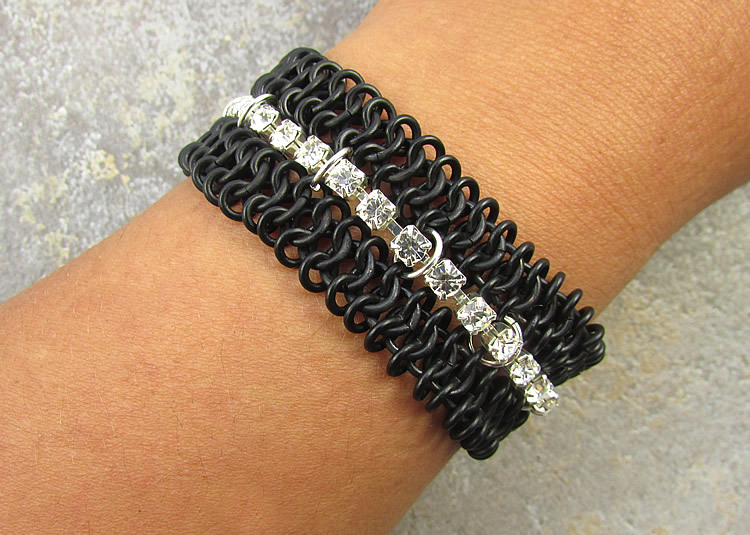 Something new I came across recently is faux chain maille. It's not truly faux as it is a chain maille weave. But you'd be faking it as it is not handmade. That's right, you don't have to make the 4-in-1 European weave if you don't want to! I learned about it through the Urban Rock Star Faux Chain Maille bracelet tutorial by Kelsy who posted it on the Shipwreck Beads blog, Loose Ends. I love how she combined the faux chain maille sections with a rhinestone chain! Another great chain maille tutorial is by Cheri Carlson over on ArtBeads. Love the way she added the suede with snap fasteners for the ends. This is a super design for male jewelry. Me too. That's one weave I dislike doing!